Dark: Brutal Burgers (Bob Evans and Cheeseburger) beat an unknown team. The babyfaces got the win when Cheeseburger hit a stunner while being carried piggyback by Evans. 1. Matt Hardy beat Adam Page with the Twist of Fate. 2. Silas Young beat Mark Briscoe in a strap match. 3. The Young Bucks beat Adrenaline Rush with More Bang for your Buck. Early favorite for match of the night, great action. 4. Kevin Steen beat Michael Bennett (w/ Maria Kanellis) by referee stoppage after three package piledrivers, the third on top of open chairs. The stretcher gimmick was thrown out about 5 minutes into the match. Post-match, Maria slapped Steen and took a package piledriver of her own. Intermish. They announced a return date to the Hammerstein for May 17. 5. ReDragon (Bobby Fish and Kyle O'Reilly) beat Outlaw Inc. (Homicide and Eddie Kingston) to retain the ROH Tag Titles with a chairshot/brainbuster combo. Crowd turned on Outlaw Inc, and really this match as a whole. A friend who traveled from Canada called this the worst match he's seen in the eight Final Battles he's attended. Post-match, Outlaw Inc. turned heel and threw garbage cans into the ring. This whole thing was lame. 6. Tommaso Ciampa beat Matt Taven (w/ Truth Martini, Kasey Ray, and Scarlett) to win the ROV TV Title by submission. Quick match but really well done. 7. Eddie Edwards and BJ Whitmer beat Roderick Strong and Jay Lethal when Edwards used an O'Connor roll. Post-match, Edwards gave his send off speech. Then, Roderick Strong and BJ Whitmer joined forces and turned on Edwards. Jimmy Jacobs ran in and hit Edwards with a spike, before taking the mic and forming an apparent heel alliance with Strong and Whitmer. 8. Adam Cole beat Michael Elgin and Jay Briscoe to retain the ROH World Title. Cole scored the win with a rollup on Elgin after Matt Hardy ran in to help Cole. After the match, Cole and Hardy had laid everyone out and were standing tall when Chris Hero's music hit. The crowd exploded. He entered the ring through the crowd and knocked out Hardy and Cole. He then took a mic, said it wouldn't be Final Battle without Chris MF'n Hero, he announced he was back, and he challenged Adam Cole for down the road. Red hot close to a pretty solid show. Seems like a decent show, two new heel factions though seems weird. Glad Whitmer is back and ready to wrestle. sound like a good show, would have been nice to see it. Hero vs. Cole should be great and hopefully Hero get an ROH title reign out of it. I am glad to see Hero back in ROH, an obvious eventuality. I am happy to see ROH putting together some solid angles. I was getting pretty worried about the company, and still am. However, They are putting it together again. It is all very safe, but fun. why is ROH so high on Matt Hardy? Sounds decent.. Hero being a top face, should freshing things a little for a bit.. Here some post show notes from pwinsider. Several TV openings were shot during Final Battle for the ROH TV series. Former WWE Creative Team member and MLW owner Court Bauer was at tonight's Ring of Honor event as he will be working with the company going forward on some marketing and branding. ROH head Joe Koff brought Bauer on board. Bauer was backstage and watched part of the show from the crowd. Chris Hero returned to the company at the close of Final Battle, laying out ROH champion Adam Cole and Matt Hardy. Hero will be a big part of the company going forward in 2014. Hero rushed to the venue from Combat Zone Wrestling's Cage of Death. The main event at Final Battle went long as they were waiting for Hero to arrive, which is why the main event went over 30 minutes. The main was awesome, by the way. The next event at the Hammerstein Ballroom won't be until Saturday 5/14. Visiting at the show were Rhett Titus, Julius Smokes, Matt Hardy's wife, Reby Sky, WWE author Keith Elliot Greenberg and the entire Brisco clan. Now that Outlaws, Inc. have turned, Smokes would be AWESOME as their mouthpiece. Homicide and Eddie Kingston went into the crowd after their match because a fan hit Kingston. Matt Hardy and Adam Cole are now together in ROH storylines. Jimmy Jacobs, Roderick Strong and BJ Whitmer are now together as a unit called the Decade, playing off the idea that they have been the constant in the company while others have used ROH as a stepping stone. Obviously, Whitmer's neck injury is not as serious as the company first publicly disclosed. Larry Legend, who has done a ton of ring announcing on the indy scene and in the MMA world, is now working for the company in the merchandise end as well as handling some voiceovers for the TV show. Ring of Honor originally planned to have Chris Hero be the mystery partner for Eddie Edwards in a match against Roderick Strong and Jay Lethal at Final Battle. However, Hero was late arriving due to working for Combat Zone Wrestling the same night. An audible was called with B.J. Whitmer teaming with Edwards, and having Hero appear at the end of the night. Powell's POV: The feeling of multiple sources is that the audible of having Hero appear at the end of the show worked out better than the original plan because it ended the show on a high note. For that matter, it was far less predictable, as it seemed everyone had Hero pegged to be the mystery partner of Edwards. I definitely think Hero as the top babyface and Whitmer forming the Decade or whatever works out better in the long haul. Swarles wrote: why is ROH so high? "The Phenomenal One" is back! A true Ring of Honor pioneer and one of the greatest wrestlers in the sport today, AJ STYLES, has been signed to compete once again in an ROH ring on January 4th, 2014 in Nashville, Tennessee! AJ Styles helped put ROH on the map in its early years by displaying his own unique blend of high-flying wrestling and hard hitting strikes. Styles has gone on to be recognized as one of the best wrestlers of our time and recently became the most sought-after free agent in pro wrestling. 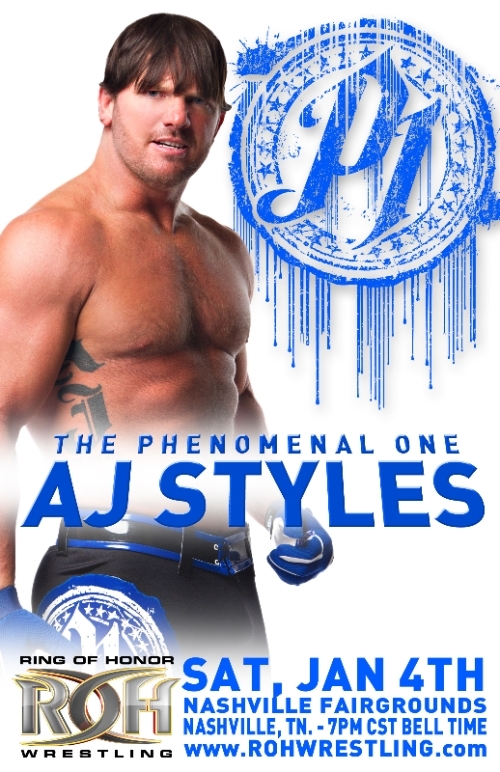 After finalizing the deal within the last couple hours we can now officially confirm that the long awaited return of AJ Styles to ROH will kick off 2014 in only 1 week at the Nashville Fairgrounds! AJ Styles will face "Mr. ROH" Roderick Strong in Nashville in a huge match that will air on ROH TV the weekend of February 1st! It has been 8 years since Styles competed in ROH while Strong has been one of the most consistent competitors in ROH for the last 10 years. We are excited to welcome AJ back but not too sure that Strong will feel the same way. In addition to the return of AJ Styles, January 4th marks the return to ROH action of Chris Hero who battles "Mr. Wrestling" Kevin Steen! Plus Wrestling Legend "Rowdy" Roddy Piper will be on hand for a very RARE Meet & Greet Autograph Signing! ROH is starting 2014 off with bang and we are not slowing down! Don't ever pass up the opportunity to experience ROH live! See why we are the best pro wrestling on the planet with the greatest fans in the world. Tickets to the biggest television taping in ROH history are available HERE! Since this is going on TV does it mean this might be more than a 1 off? They would probably like it to be more than a 1 time thing, but I don't think that's the case. JustSkiff wrote: They would probably like it to be more than a 1 time thing, but I don't think that's the case. I mean if he's done with TNA for reals i don't see why he wouldn't be atleast a semi regular. There were reports in this weeks Observer that he might be at the live TNA show in Huntsville. Who really know what Styles is doing and who he may or may not be contracted to. Yeah, who really knows what actually going on at this point.. It went Bill Behrens (Aj's Agent) telling promoters that AJ and TNA were closing in on deal so book him while you can a few days back to yesterday this date being announced and Pwinsider saying the latest word on negotiations between AJ Styles and TNA is that they have fallen apart and the chances are slim that he will be returning to the company any time soon. I mean maybe he's using this for leverage against TNA, but the fact that this is going on TV leads me to believe he's not associated with TNA in anyway right now. Wish he was working someone besides Strong. It'll be a good match, but not one we haven't seen before. Looks like AJ is going to make multiple appearances for ROH after all. If and I do mean IF TNA is working a angle here with AJ, they need to be careful of two things. One the audience losing interest by having Styles gone for too long a period and Two, TNA getting Pillman'd by Styles finding a better deal and signing elsewhere (Like Pillman did to Bischoff/WCW during the Loose Cannon angle). It sounds like he's getting the London deal. omg guys it's 2006 all over again. 2006 was a great year for indies. I am down. If AJ really ends up with ROH for the long run, then it looks like I'm going to make it a point to watch ROH on a regular basis. I was disappointed about Chris Hero's WWE release, so him resurfacing in ROH will also make their shows more appealing for me. Hero and Styles could really help ROH. ROH actually had a lot of good shows this year.